And now some of the mysteries are solved! Via casting breakdowns, GreenArrowTV has learned a little bit about some of the characters we’ll be seeing in The CW’s pilot Arrow. Disclaimer: It is not the intention of GreenArrowTV to ruin any secrecy regarding this project, but instead to get people excited and interested in more. In other words, DC or WB – hopefully this a good thing rather than a nuisance, although if there is a takedown request, please contact us and it will be respected. Oliver Queen – It’s pretty obvious this would be the name of the main character, right? It sounds like he was believed dead for a few years before making a return home. At some point Oliver is kidnapped and cuffed to a chair but gets himself loose. The Arrow wears a green body armor that is “so dark it’s virtually black.” He has a bow and arrow, of course. He may have a mask covering the lower half of his face, distorting his voice. The costume also has a hood. It sounds like this version of Oliver Queen is at least 25, and he is written very much like the Green Arrow was in his better Smallville appearances. It also seems that we will see flashbacks to his time on the island and how he got there, and what led him to becoming a good guy. How does it sound, so far? UPDATE: More details about the characters being cast for Arrow have now surfaced! Check them out here! What do you think? 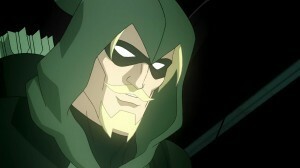 Come talk about the Green Arrow pilot Arrow on our forum!